The Sechelt Fire Department has been in operation in various forms for approximately 75 years. Officially formed in 1945 it was established again in 1966 under letters patent of an Improvement District called the Sechelt Fire Protection District. The department provides Fire Protection to two distinct areas, the District of Sechelt and the Sechelt Indian Government District. The District of Sechelt (DOS) is home to approximately 11,000 people spread amongst 4,830 hectares, within eight local communities. The Sechelt Indian Government District (SIGD) is still one of the only Native groups in Canada to obtain self government and is home to approx 1,300 people. They are by all accounts a very progressive and modern Indian Band. Overseeing the Improvement District is a Board of Trustees. They are a publicly elected, 5 member Board that has taxing authority over the properties within the fire district. As mentioned the Board has established the Fire Department headed by a Fire Chief. The Chief administers several staff that support the Volunteer Officers and Firefighters. From all accounts we are a bit unique given the fact that we are a self governing local Improvement District that provide these services to two unique and separate forms of local government. We also have fire suppression agreements with a third and fourth level of government, namely the Sunshine Coast Regional District (SCRD) and the Ministry of Forests (Province of BC). 2 Fully Rated Triple Combination Pumpers. These services are provided from a single Station centrally located 5525 Trail Avenue in downtown Sechelt. Firefighters are dispatched through a Regional/GVRD 911 system that is located in Vancouver at the E-Comm building on West Hastings St. The Sechelt Fire Department assists with incidents, as required, under Mutual and Automatic Aid agreements that are in place with the Gibsons, Roberts Creek, Halfmoon Bay and Pender Harbor Fire Departments. Trevor Pike CFO, LAFC. The Fire Chief is responsible for managing and overseeing all aspects of the fire department including but not limited to: administration, operations, training, prevention, inspection, investigation, public education, public relations, recruitment and all other duties required to provide this service to the public. Dwight Davison, LAFC: The Assistant Fire Chief is responsible for all aspects of fire department training, operations and apparatus/equipment maintenance. Matt Gilroy, LAFC: The Fire Prevention Officer is responsible for Fire Prevention. This job entails plan and development review, pre-plan development, managing the inspection program, conducting some fire inspections, fire investigation and public education sessions. Steven Achterberg, LAFC: Steven is the Fire Prevention Inspector and spends most of his days conducting fire inspections, fire investigations and public education sessions. Brenda Poole: Brenda is responsible for all aspects of accounting, finance and reception . She is also one of our auxiliary firefighters. The bulk of the fire ground operations and the command and control of fire suppression activities is mostly in the hands of the volunteer officers and firefighters. Career staff plays a support role or perhaps a command or safety role if required. We have a contingent of 12 Officers comprised of 2 Chief Officers, 4 Captains and 6 Lieutenants. 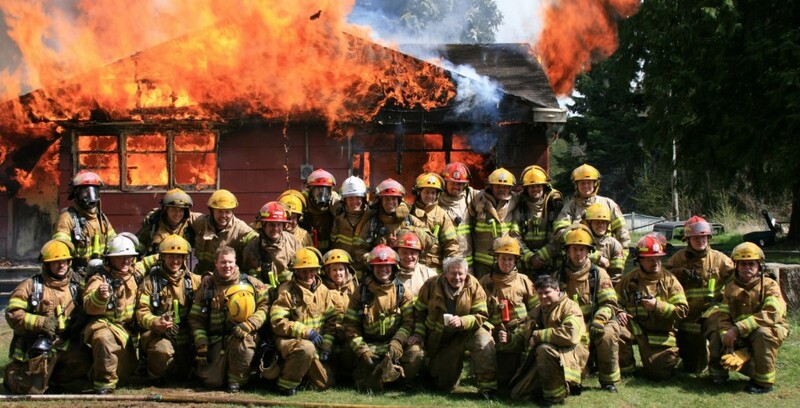 These would be the people that you would see actively directing and participating in fire ground operations. The fire department has appointed an official Safety Officer as part of our Occupational Health and safety program.